So, last week my wife bought me this backpack as our anniversary present and I took it out for a 19 miler yesterday in the blazing sunshine. 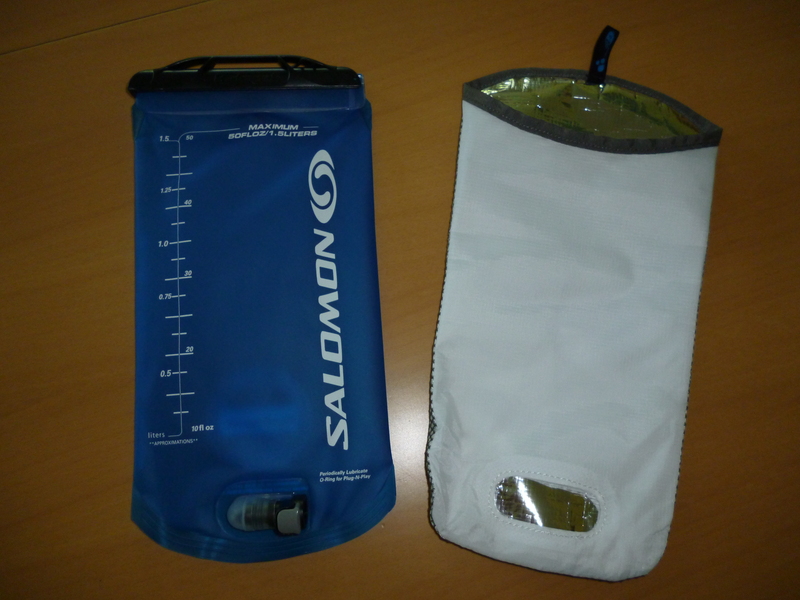 So firstly, what does Salomon say about there pack? More often than not you read a description and think “sounds good but really?”, well this is pretty much spot on. 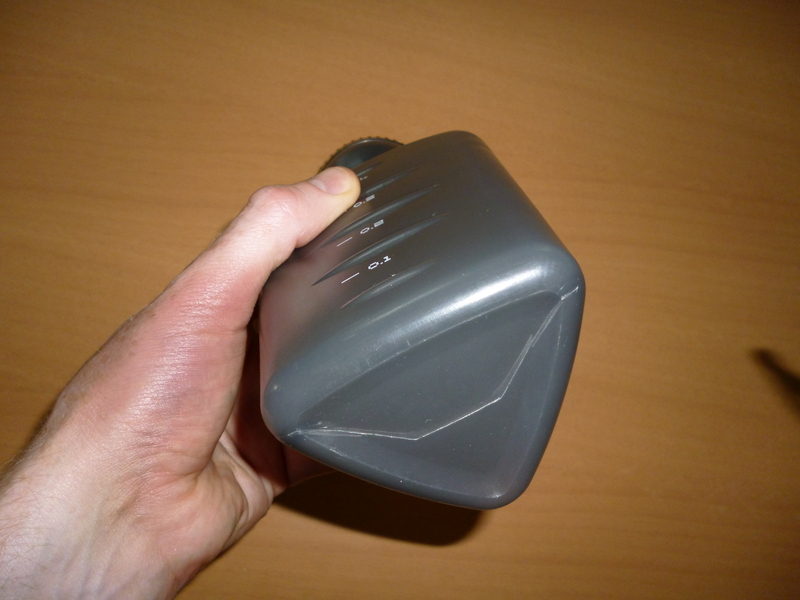 This is the bladder that comes with the backpack, the Hydrapak 1.5 litre replaces the Source bladder on the older versions of the S-Lab 5. 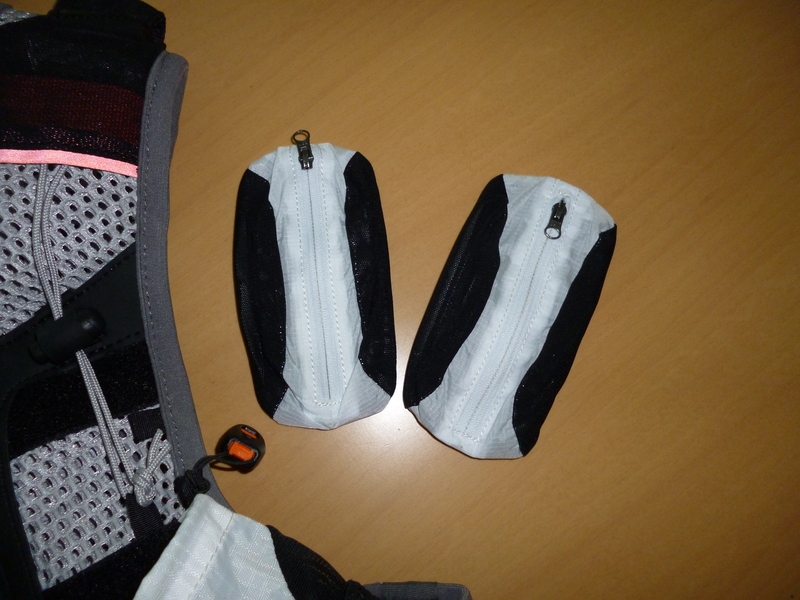 Next to it is the insulated sleeve that the bladder sits in. The Hydrapak insulated hose doesn’t actually come with the pack, the older version came with an insulated Source hose but this came with a normal (all be it shorter) hose, this I purchased as an addtion. 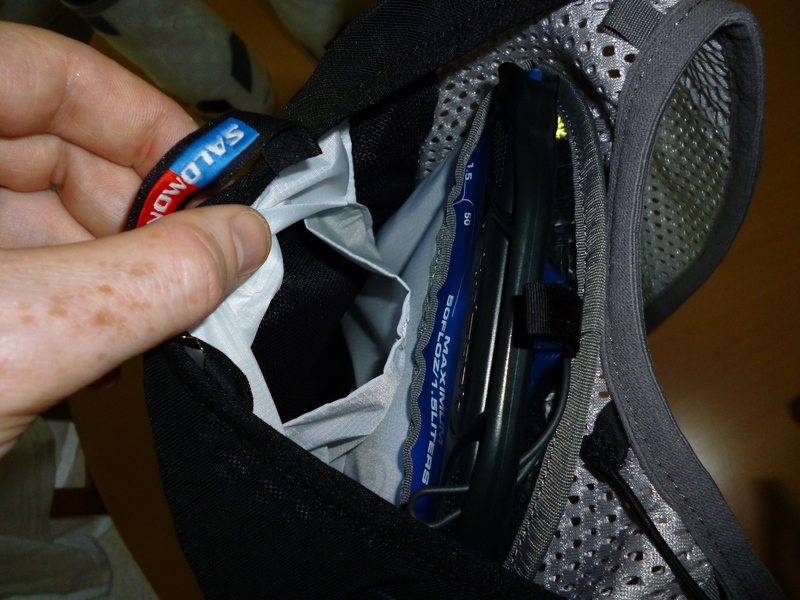 There aren’t a lot of photos on the various websites showing in detail what the water bottle/chest pockets can hold. 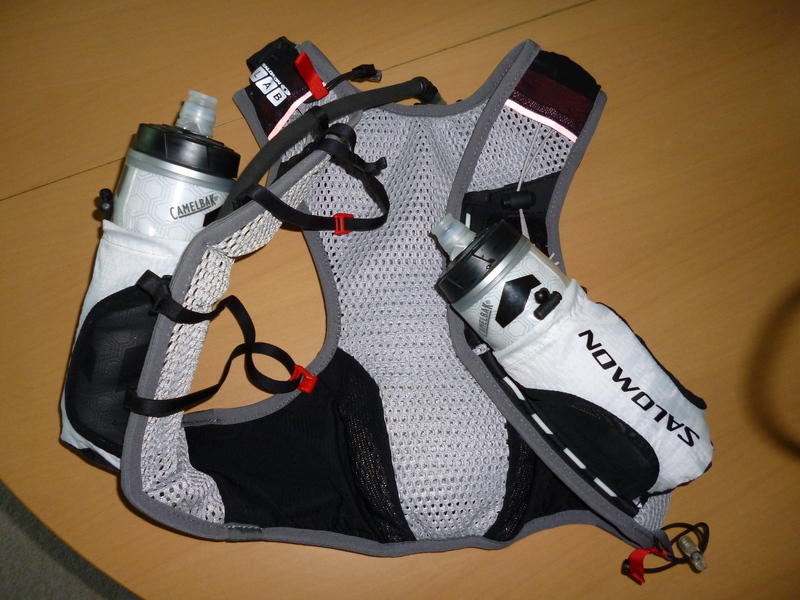 I used both these for my run, 625ml Camelbak Podium Chill bottles, they fit fine and are easy to get in and out. What’s it like to run in? Simple really, I will never run in a normal rucksack again!! This is the future, gone are shoulder straps and waist belts, gone is having to constantly adjust the straps, gone is not being able to breath properly due to no give, this solves all the issues. 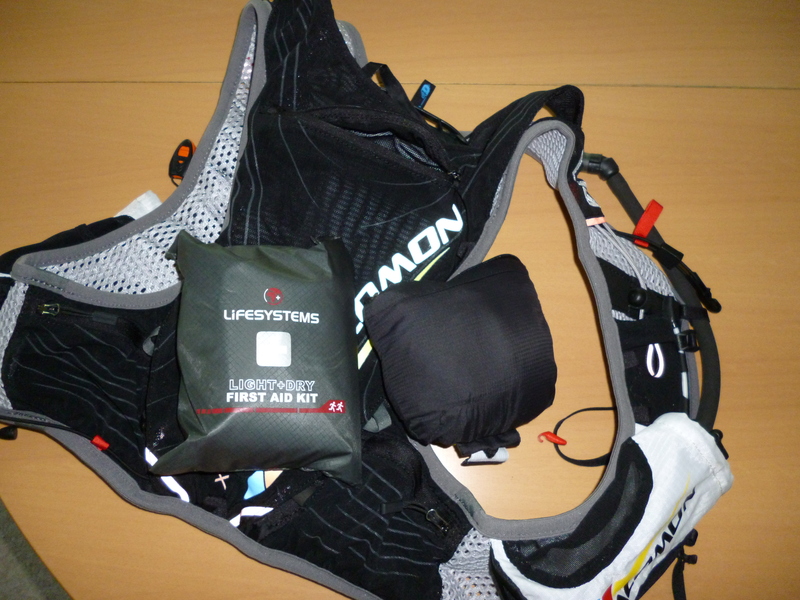 I have tried a number of small light backpacks, the Haglofs Stamina 5, the Olmo 5, Inov8 12 litre and the OMM 15 litre. 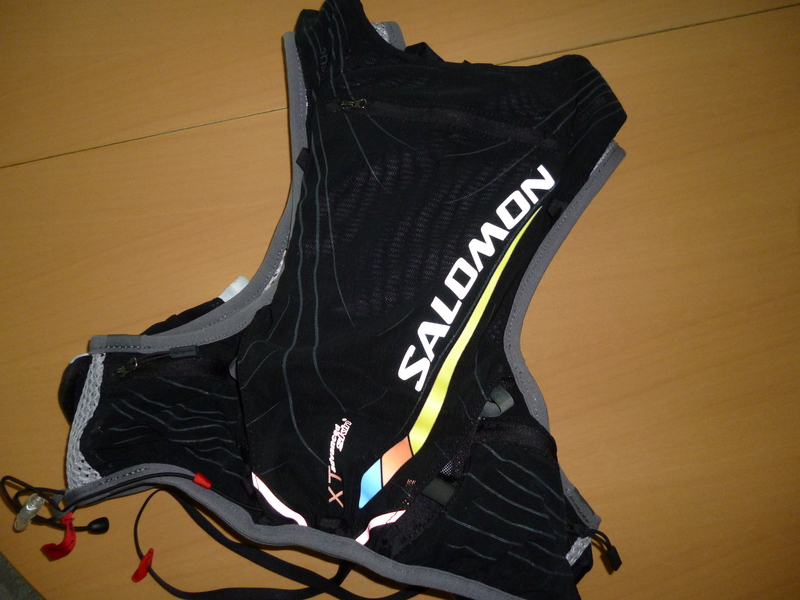 Being an average sized guy (96cm chest, 85 cm waist/38inch, 33inch) I have had trouble finding a backpack that fits comfortably, so was sceptical of the Salomon until trying it on. 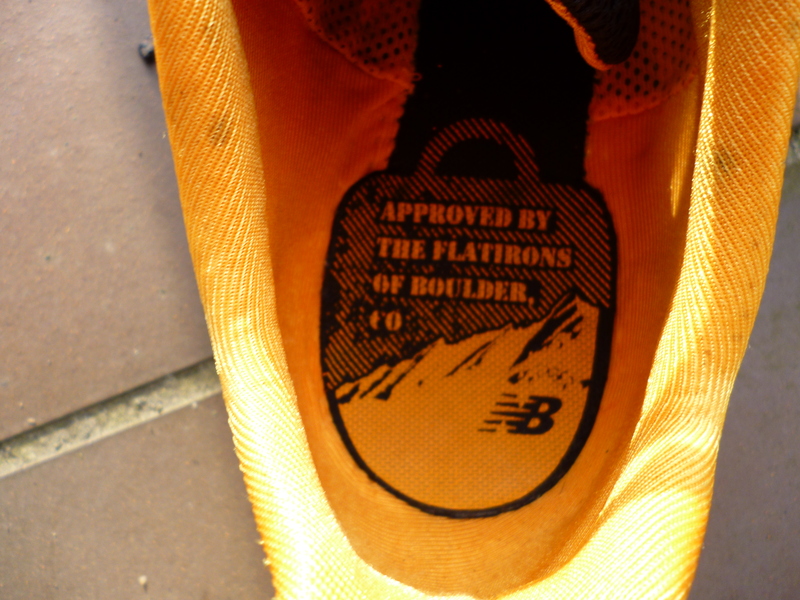 The thing fits like a glove and more importantly flexes with your body, so you never feel constricted when running. From never wearing it to running 19 miles I haven’t got one sore point, at no point did I have to stop and adjust it, even as the water in the hydration bladder drained it still sat snug to the back. I did find with the two podium bottles in the chest pockets forced me to adapt my running style, as the bottom of the pocket would hit my biceps as I ran, but I think this is partially me being on the upper limit of the M/L sizing. Not a great deal really and its more personal opinion, I would like some more pockets on the front. 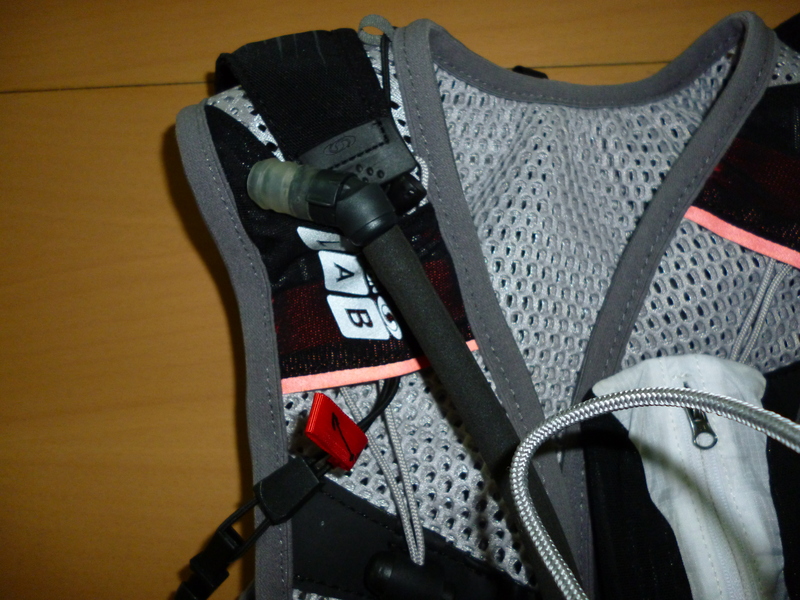 Maybe combine the front fastening points into one mesh clip with pockets on it. Also there doesn’t seem to be anyway to add more modular items, such as a front pack. 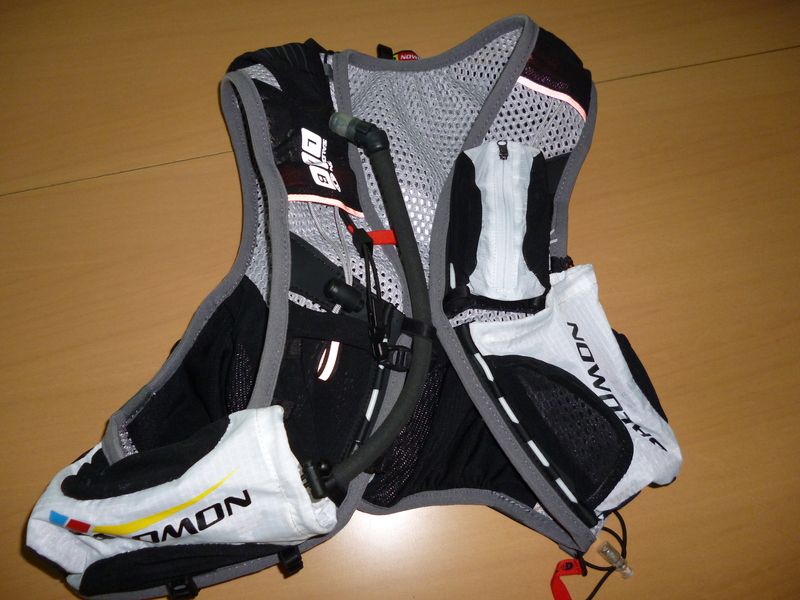 If you are looking for a fast and light hydration pack which fits snug, then yes, if you have ever used a hydration pack and suffered from the straps not fitting quite right, a waist strap and chest strap that put pressure on your breathing then this is the one for you. 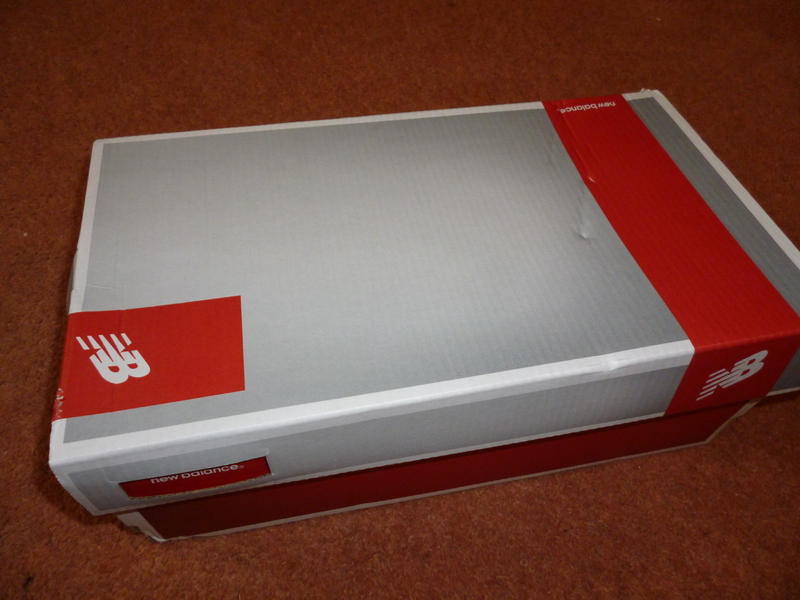 Its fairly pricey at £120 rrp, but you can find it cheaper. One thing to be sure of is the sizing, it comes in XS/S and M/L, I have the M/L and I don’t think it would fit someone much bigger than me. 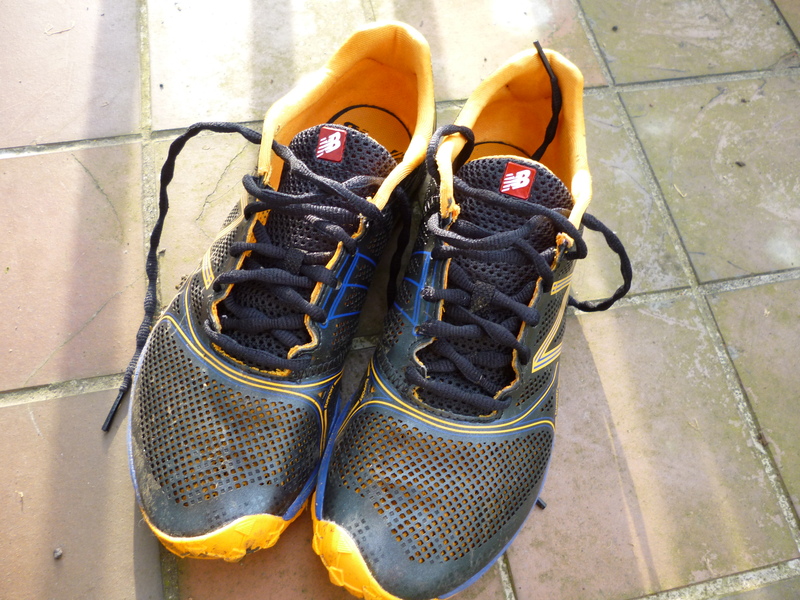 So I have had these trainers for a couple of days, today being the first outdoor test (it is a sunny day so thought I would take the opportunity). Firstly, I quite like the colours (que ginger/orange shoe jokes), the black, orange and blue works well. The synthetic material on the upper works well, with an inner mesh which lets the feet breath and water drain away. 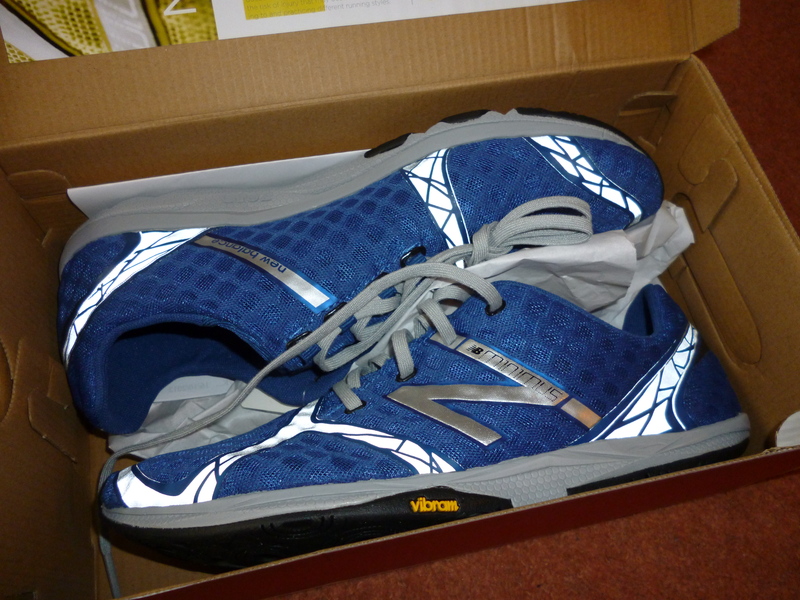 Putting the shoe on (size 8) the fit is snug, similar to the New Balance Minimus Trail, the shoe is designed to be worn with or without socks although even with there is a reasonable gap for my toes. 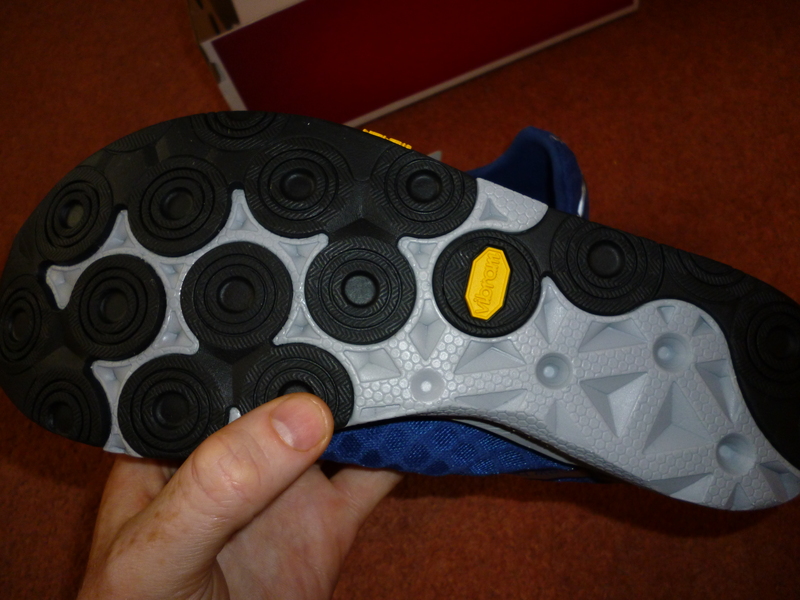 For my test it was a short 3 mile run around Lloyd Park, on the road heading up to the park the first thing I noticed was the increased cushioning from the slightly increased stack height. 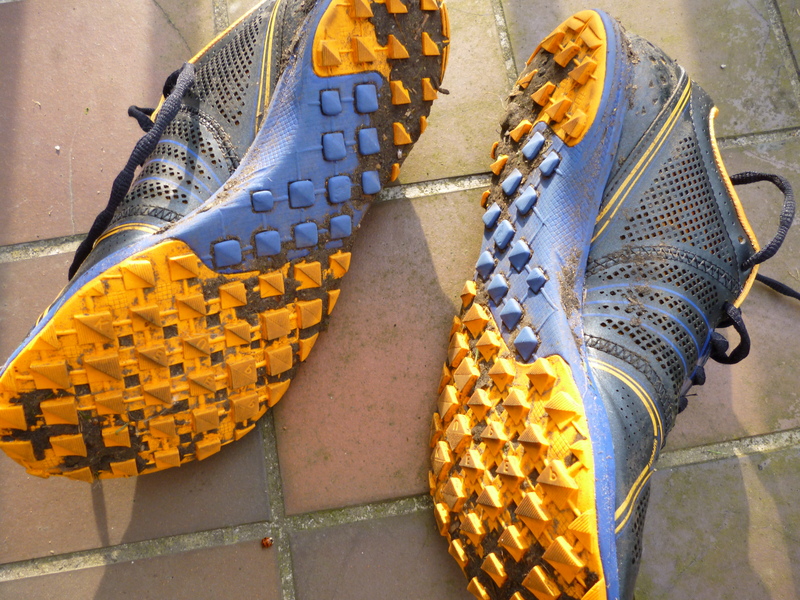 Upon transferring to grass the grip started to come into its own, and with the park still being sodden from the rain I was able to give them a test on proper mud, and even they draining ability from running through what effectively was a marsh! I did notice a bit of a roll inwards when I was running, something which I didn’t get from the Minimus. 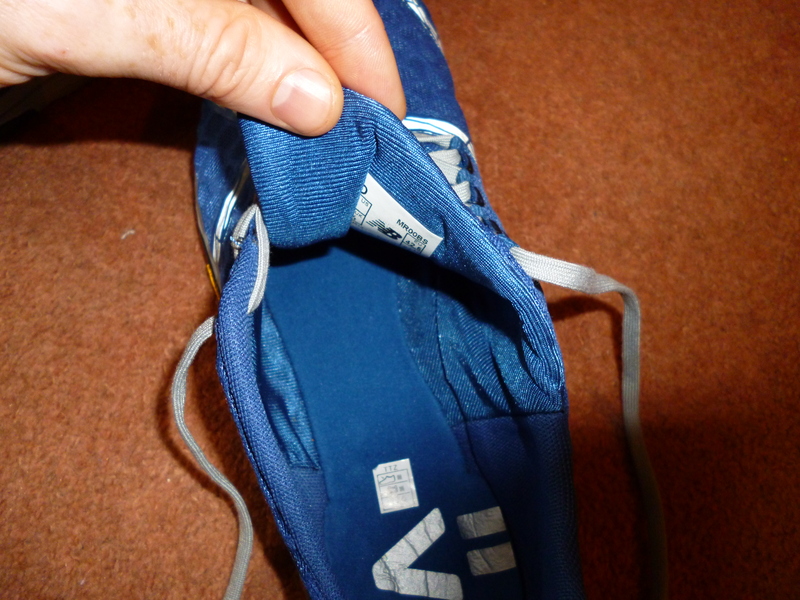 I am hoping this is just the EVA sole bedding in and will go after a few runs, also the laces will have to go and I will replace them with Lock Laces sooner rather than later. I should get a better feel for them as the week goes on and the real test will be the long run on Saturday, however they do seem to be keepers and I will probably get a second pair. 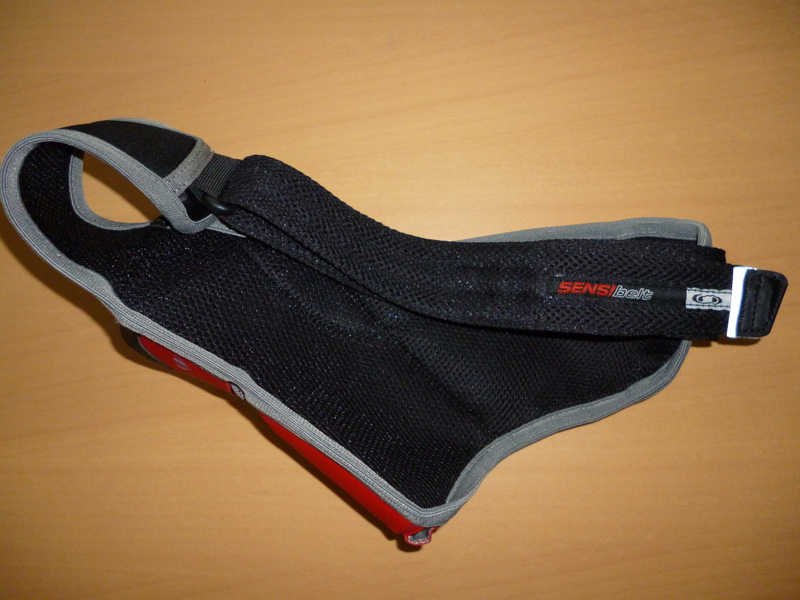 I have been using this running belt for quite a while now and overall I am really impressed. 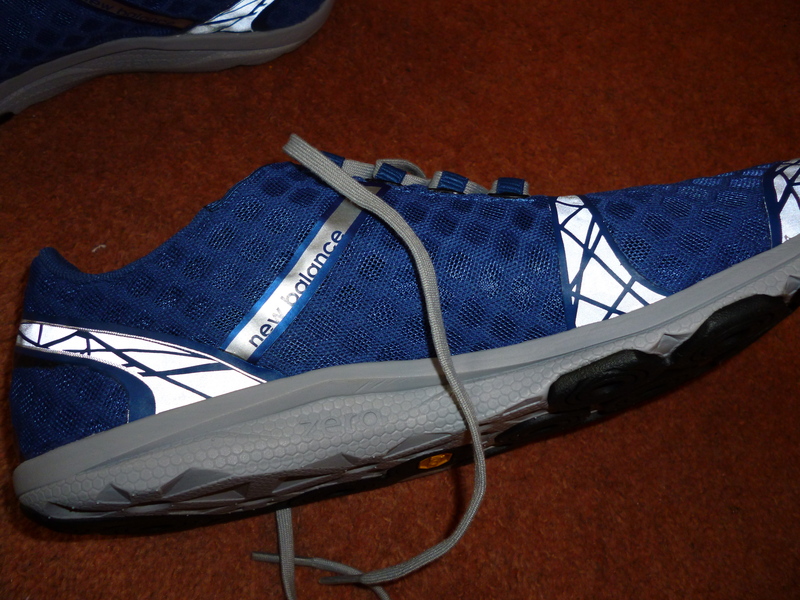 There are some really nice design touches which make it perfect for those shorter runs. The belt itself is made from 210D Double Ripstop fabric with an airvent backing to let sweat through, and has a good feel of quality to it. 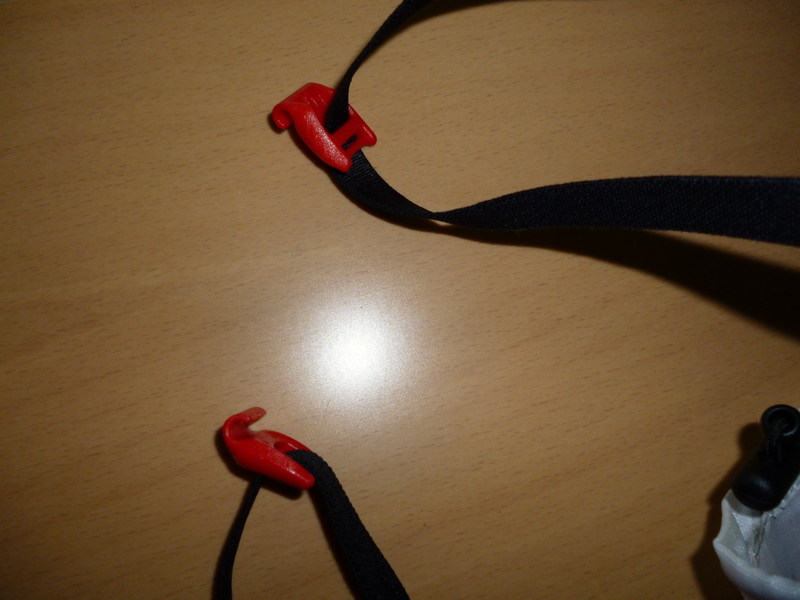 Rather than a normal clip to fasten the belt it uses velcro to ensure that you always get a secure fit. You can see from the photo that it only has the bottle holster and a zipped mesh pocket which can just about fit a phone, keys and a gel. 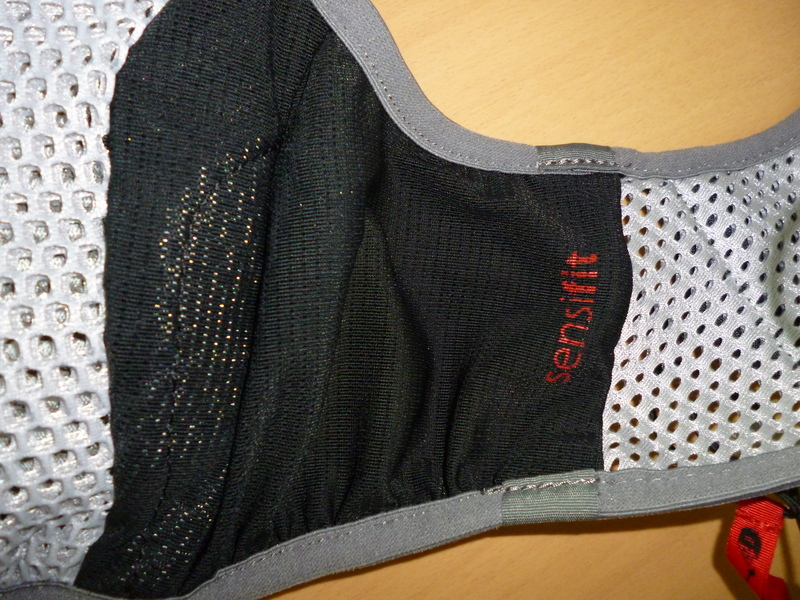 I would have preferred that the pocket was waterproof rather than mesh, particularly with British weather, but I am guessing the this was mesh to keep breathability high. 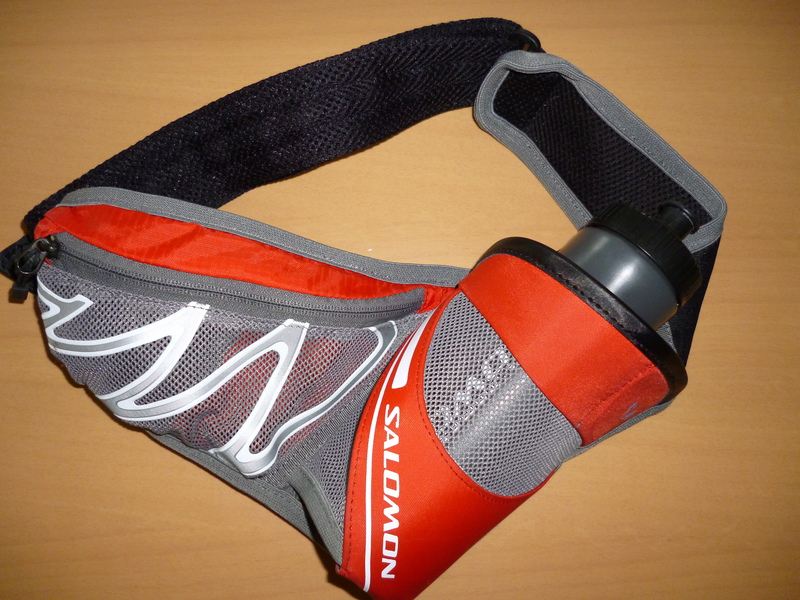 With the bottle inserted, even full to the brim the whole belt sits nicely on the lower back and doesn’t really bounce. 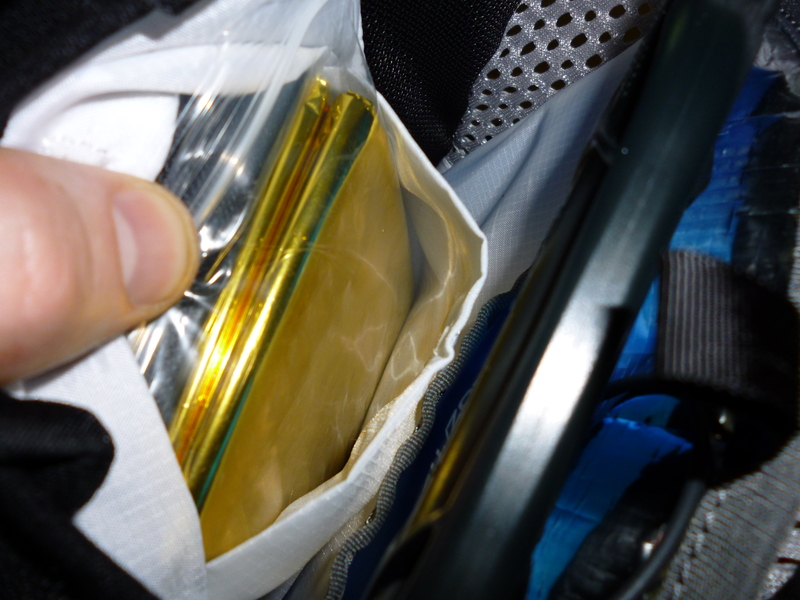 I generally wear the belt lower around my hips opposed to around the waist and have used it in conjunction with the OMM Ultra to give me the capacity to carry about 3.5 litres of fluid, the whole let fitted together well. 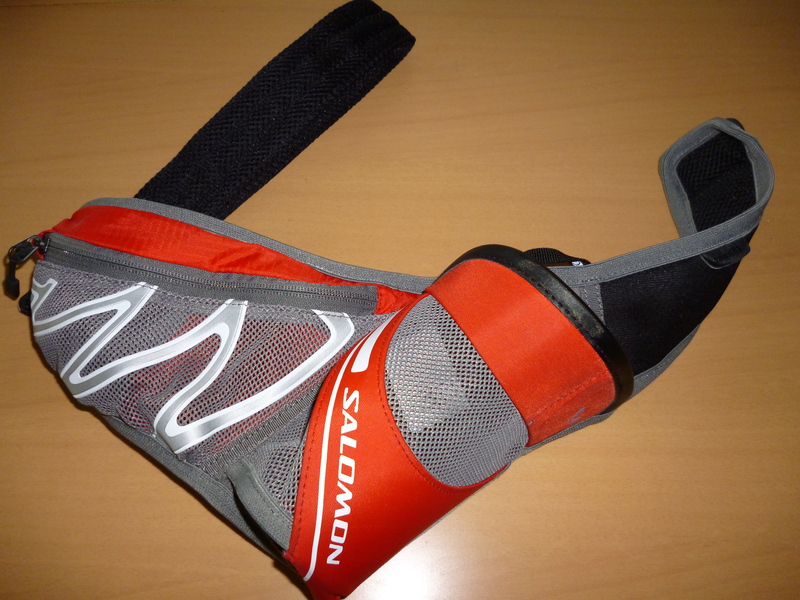 Overall pretty impressed and will keep using this for those runs that don’t require too much kit, one gripe is the mesh pocket but you can get around it my using a small waterproof bag for things like phones etc, and you can pick one up for about £25.00 so doesn’t break the bank either.